This year we had a guest for Halloween, at our AireHotel we offer turn down service and wake up calls. 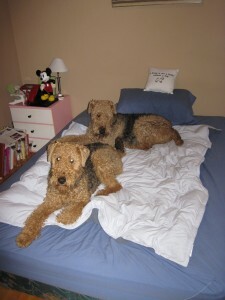 They look much the same and assume that you are able to make enough room on the bed to get some sleep. Gator wanted to make sure that everyone saw the decorations. 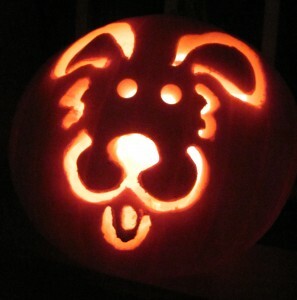 We found the perfect pumpkin stencil here. If for some reason that is not working download here. 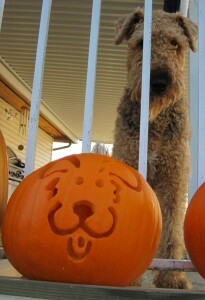 Here is Gator and her pumpkin. Elliott was too busy trying to sample other pumpkins to appear. On a more serious note remember the following Halloween safety tips. As much as your dog or cat may beg for some of your Halloween candy, always remember that chocolate is deadly to them in any amount. The wrappers, such as tin foil, can get stuck in your pets digestive tract and make them ill or cause death. Please comment on what works for you to help your pets through a night of fireworks.